Impossible is not in a superhero’s vocabulary because their lexicon is defined by miracles. Their bravery replaces fear, and their extraordinary strength overcomes every challenge. This is their super power that fuels a force that changes the world. Most people believe this fictitious character only lives on the page of their kid’s book. Maybe these people will start to believe that superheroes are indeed a real thing once they begin reading about a young girl called Rylie Maedler. When Rylie was seven-years-old she began harnessing her superpower. 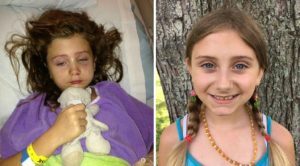 It took inner strength, bold bravery and a “mysterious” miracle – medical cannabis – to fight bone tumors that were aggressively eroding the structure of her face. “When your kid is really sick and you’re given devastating news, even if you’re religious or not, you start praying and looking for a miracle,” Janie Maedler, Rylie’s mom, admitted. The answers were around; the miracles were not a mystery anymore. “God put a plant here for us to use. When I discovered what cannabis can do and how much it helps, you realize that God’s answer was the miracle – medical cannabis,” Janie continued. The medicinal miracle, in oil form, provided unexpected results: fast facial bone regeneration, a smile with pearly white survivors, reduced pain levels, controlled seizures and the prevention of any tumor recurrence. Despite the treatments efficacy, Rylie’s doctors questioned her use of cannabis; it was considered impossible, immoral and ill-advised. Her Delaware state politicians were as skeptical as the doctors about the effectiveness of cannabis for pediatrics. 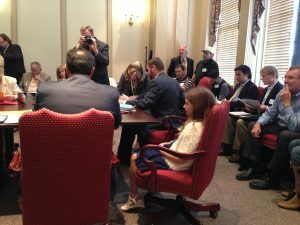 Now twelve-years-old and with a tumor free face, Rylie has changed the face of Delaware’s cannabis legality by advocating for pediatric cannabis legislation. As a true superhero, she was prepared to tackle a seemingly impossible job. She was persistent and persuasive when tasked to convince legislators who were strictly committed to voting “no” to legalize medical cannabis for pediatrics. “Legislators don’t know what the truth is, and they think about cannabis as something completely negative…We explain to them that it’s not about religion, but rather, it is about the life of a child, your daughter or your son. We ask them to consider ‘what if cannabis was your only option?’…then they begin to understand,” Janie explained. Perhaps everybody simply needs to listen to Rylie explain the truths about cannabis. 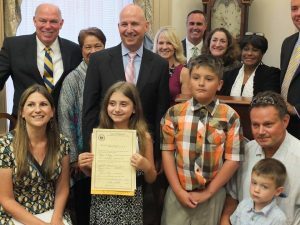 Her initiative, which originated as a handwritten letter sent to Delaware legislators, materialized into a bill, called Rylie’s Law, that passed unanimously. One great leap led to small steps in reform. Although pediatric patients were safe to take their medicinal cannabis, taking their medicine was forbidden on school property. Rylie decided to write a letter to her legislators to explain that the law put her in dangerous conditions and alienating situations. 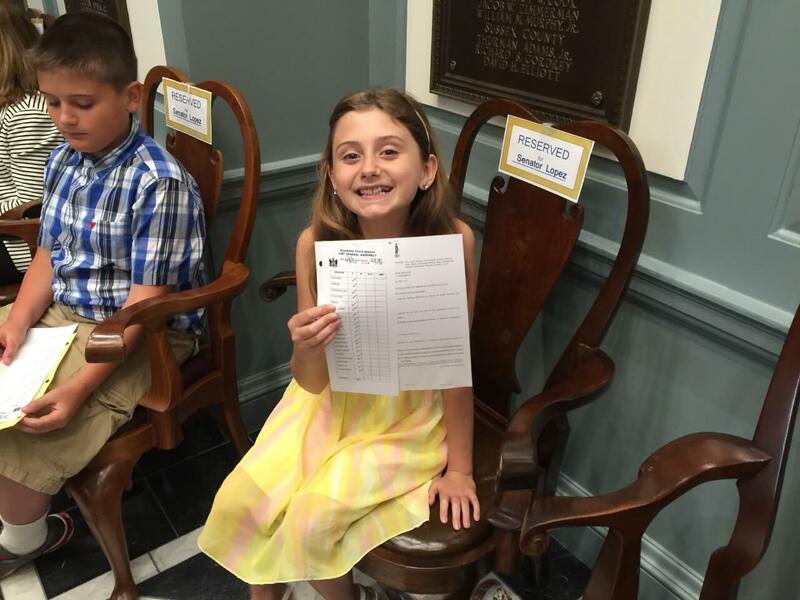 She spoke at the Senate, and was heard loudly as a unanimous vote passed to allow pediatric patients to receive their medical cannabis treatment at school, administered by a legal guardian or caregiver. Superhero sidekicks like Rylie and Janie continue to prove that anything is possible. “We added autism to the list of eligible conditions and are making access easier. We’re passing legislation step by step,” the mommy-daughter duo said together. “Right before Rylie’s Law was signed in June 2015, I asked for a foundation to help other kids,” Rylie quickly added. A fundraiser where Rylie’s foundation had a concert at the local high school and surprised one of the students. Through her 501(c)3 charity, Rylie’s Smile Foundation, pediatric patients are gifted an Apple iPod to “help kids stay distracted from the scary things in the hospital,” Rylie said. The organization also advocates and educates families about alternative treatment options for their children. Adding to her collection of superhero roles, Rylie decided to add another costume to her closet. After discovering that her medical cannabis was moldy, she became worried about the quality of cannabis medicine. Rylie was inspired to start Rylie’s Sunshine, a research based company that provides patient consultations for medical cannabis and produces a high-quality, lab tested cannabinoid-based oil. For some kids, it’s all about cakes and cookies, but for Rylie it’s all about charity and cannabis. Another fundraiser organized by Rylie’s foundation: a sunset cruise for children battling serious illness. “It’s cool because I can help a lot of people at a young age. I’m not waiting to help people. I’m helping them now,” Rylie continued with poise and maturity. She may be young, but age is just a number because ambitious goals are what count. Rylie is a CEO, a founder, a fighter, a student and a superhero. When mothers become medical experts, students become teachers and the young generation possesses political power to pass legislation, we begin to see who the real heroes are amongst us. Rylie wears a superhero cape; it may invisible to the naked eye but her impact is clearly visible.